This cover is dated the first day of the battle for the Liberation of Paris, 19th August 1944, which ended with the surrender of the German garrison on 25th August. It features a label depicting General Charles de Gaulle. The letteres FFI at the top stand for Forces Francaises de l'Interieur, French Forces of the Interior, essentially the French Resistance. MLN at the bottom stands for Mouvement Liberation Nationale, the National Liberation Movement. The cover also features a 1f50 postage stamp depicting Marshal Petain, Chief of the French State during the German occupation. 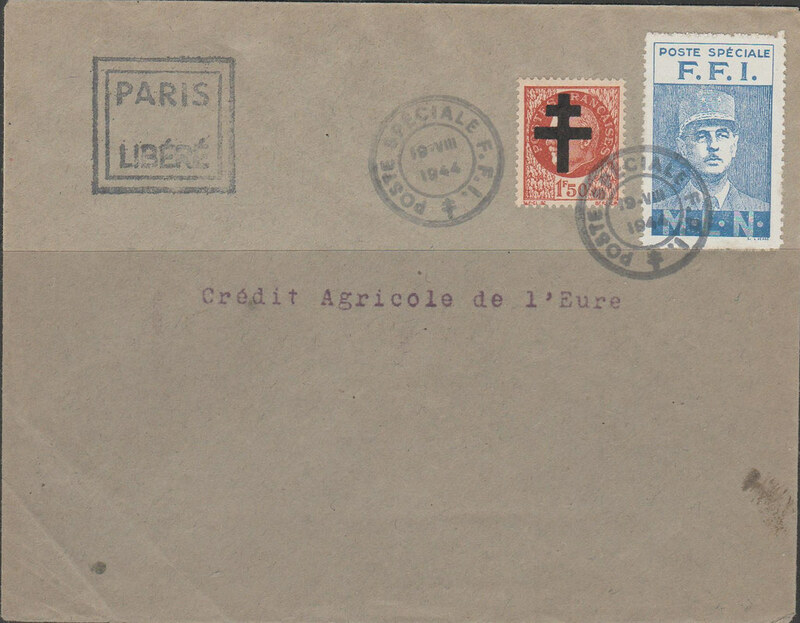 The stamp is overprinted with the Cross of Lorraine, the symbol of the FFI. The purpose of the cover was to enable the normal carriage of FFI mail during the Liberation. An FFI document explains that, in this case, the address, Credit Agricole de l'Eure, was code for the Centre d'Action des Resistances Etrangeres. An excellent reference for this is Propaganda and Espionage Philately, written by Herbert A Friedman, at psywar.org which also tells us that many covers were prepared as souvenirs at the time and after! I will say this only once. "Nice piece of postal ephemers". Very nice - thank you Daniel.